For every San Francisco earthquake and Superstorm Sandy, some die—and others profit. In 2007, a financial firestorm ravaged Wall Street and the rest of the country. In 2012, Hurricane Sandy obliterated a substantial chunk of the Atlantic seaboard. We think of the first as a man-made calamity, the second as the malignant innocence of nature. But neither the notion of a man-made nor natural disaster quite captures how the power of a few and the vulnerability of the many determine what is really going on at ground level. Causes and consequences, who gets blamed and who leaves the scene permanently scarred, who goes down and who emerges better positioned than before: these are matters often predetermined by the structures of power and wealth, racial and ethnic hierarchies and despised and favored forms of work, as well as moral and social prejudices in place before disaster strikes. When it comes to our recent financial implosion, this is easy enough to see, although great efforts have been expended trying to deny the self-evident. “Man” did not bring the system to its knees; the country’s dominant financial institutions and a complicit government did that. They’ve recovered, the rest of us haven’t. Sandy seems a more ambiguous case. On the one hand, it’s obvious enough that an economy resting on fossil fuels played a catalytic role in intensifying the storm. Those corporate interests profiting from that form of energy production and doing all they can to defend it are certainly culpable, not the rest of mankind which has no other choice but to depend on the energy system we’re given. On the other hand, rich and poor, big businesses and neighborhood shops suffered; some, however, more than others. Among them were working class communities; public-housing residents; outer borough homeowners; communities in Long Island, along the New Jersey shore and inland as well; workers denied unemployment compensation; and the old, the sick and the injured abandoned for days or weeks in dark and dangerous high-rises without medical help or access to fresh food or water. Help, when it came to these “disadvantaged” worlds, often arrived late, or last, or not at all. Cleaning up and rebuilding New York City and other places hit by the storm will provide a further road map of who gets served and whose ox gets gored. It’s ominous, if hardly shocking, that Mayor Bloomberg has already appointed Mark Ricks of Goldman Sachs to the business-dominated team planning the city’s future. Where would this billionaire mayor turn other than to his fraternity brothers, especially in this era when, against all the odds, we still worship at the altar of the deal-makers, no matter their malfeasances and fatal ineptitudes? 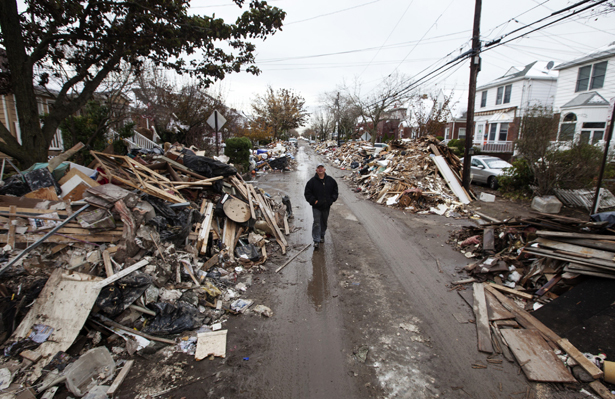 Still, it is early days and the verdict is not in on the post-Sandy future. However, an incisive analysis by sociologists Kevin Fox Gotham and Miriam Greenberg of what happened after the 9/11 attacks in New York and in New Orleans after Hurricane Katrina offers some concrete forebodings. Everyone knows that, as soon as Katrina made landfall, the racial divisions of New Orleans became the scandal of the month when it came to which communities were drowned and which got helped, who got arrested (and shot) and who left town forever. To be poor in New Orleans during and after Katrina was a curse. To be poor and black amounted to excommunication. Gotham and Greenberg prove that, post-9/11 and post-Katrina, reconstruction and rehabilitation was also skewed heavily in favor of the business community and the wealthier. In both cities, big business controlled the redevelopment process—and so where the money landed and where it didn’t. Tax breaks and private sector subsidies became channels for federal aid. “Public benefit” standards, which once accompanied federal grants and tax exemptions to insure that projects served some public purpose, especially to “benefit persons of low and moderate income,” were eliminated, leaving poorer people out in the cold, while exacerbating existing inequalities. Governments scurried around inventing ways to auction off reconstruction projects to private interests by issuing tax exempt “Private Activity Bonds.” These were soon gloriously renamed “Liberty Bonds,” though the unasked question was: Whose liberty? The lion’s share of grants and exemptions went, of course, to the biggest corporations. In New York, more than 40 percent of all bonds, or $2.4 billion, went to a single developer, Larry Silverstein. Second to Silverstein was—don’t be shocked—Goldman Sachs. Yet these institutions and their inhabitants represented at best a mere 15 percent of those affected, most of whom were low-wage workers who, in some cases, ended up getting evicted from their homes thanks to those business-oriented tax breaks. Federal aid, hypothetically tied to building affordable housing and the creation of living-wage jobs ended up as just that: hypothetical. Indeed, the original “upper tendom” faced its own “natural” disasters during the Gilded Age. Then, too, such catastrophes exposed the class and racial anatomy of America to public view. Then, too, one man’s disaster was another’s main chance. Whether you focus on the cause of the calamity, the way people reacted to it or the means and purposes that drove the reclamation afterwards, disasters and capitalism metabolized together long before “disaster capitalism” became the nom de jour. Mrs. O’Leary’s infamously rambunctious cow did not kick a lantern into a batch of hay and start the Chicago fire of 1871. To this day, however, many probably still believe the story, even though the journalist who first reported it admitted a mere 20 years later that he’d made it up. It was a story that stuck because it meshed with the ethnic and social fears and prejudices of bourgeois Chicago. Irish and German immigrants then filled up the congested warrens of that Midwestern center of industry and commerce. Their customs, religions, languages, political beliefs and proletarian status were alien and alarming—especially because that was the year of the Paris Commune, when proletarians took over the French national capital for two months. It was an event that scared the daylights out of the “upper tendom” and broad stretches of the middle classes as well in cities and towns throughout the US. Chicago’s papers were full of stories about “petroleuses,” “amazon-like women” with “long flaming hair” coursing through the streets of Paris hurling the equivalent of Molotov cocktails at the French National Guard. Could it happen here? That was the question. Impoverished immigrant workers were already raising a ruckus in mines and on railroads. Perhaps as in France, so in Chicago they would become conspirators and incendiaries. Perhaps the great fire that gutted the city was no accident. Even if it was, weren’t there those prepared to make malevolent use of it? Rumors of secret societies, revolutionary arsonists and mass assaults on property circulated widely by word of mouth and through the Chicago media. So Mrs. O’Leary proved an especially apt scapegoat for the conflagration, fitting perfectly the temper of the time. She was, after all, “low class” Irish at a moment when her immigrant countrymen were still despised as rustic potato eaters, bestial and good for nothing but back-breaking labor. It was also known that they were all too Catholic, notoriously fond of alcohol and quite capable of terrorizing British landlords back home. Less talked about was the likelier cause of the fire: namely, the unimaginably congested neighborhoods of the poor, made entirely out of wood—houses, signs and sidewalks, too. These had for years been the sites of frequent fires (two a day in 1870). Such frail structures became kindling for the flames that would in 1871 end up leveling downtown banks, businesses and the homes of the rich. Relief agencies, mainly privately run, were charged with aiding only the “worthy,” and they were “deserving” of help only after close inspection of their work habits, family arrangements, home economics, drinking customs and so on. Civil War General Phillip Sheridan established martial law and was quick to fire on suspected looters, while enforcing a curfew to keep the “twilight population” in check. At the same time, Chicago’s business elite, its civic leaders and a remarkable roster of first-rate architects went about reshaping downtown Chicago into a modern hub of commerce and culture that they hoped would rival New York. Real-estate speculators made a fortune, although none were known to have been shot for looting. For some, in other words, the fire functioned as a fortuitous slum clearance/urban renewal program on speed. The fire was out but only for the time being. The fires of social insurrection were still smoldering and would flame up again and again in the streets of Chicago throughout the rest of the century. An unnatural disaster! With a “roar like thunder,” a wall of water 60 feet high from Lake Conemaugh, believed then to be the largest artificial body of water in the world, came racing down a canyon near Johnstown, Pennsylvania, at 40 miles an hour. Everything in its path was swept away, starting with Woodvale, a company town run by the Cambria Iron Works. Johnstown itself was next as the tidal wave rushed on relentlessly drowning and destroying bridges, oil tankers and factories. It tossed locomotives, railroad cars and even houses into the air. It ended the lives of more than 2,200 people. Seven hundred and seventy-seven were never identified and are buried in the “Plot of the Unknown.” Johnstown has been memorialized ever since in song and story. Was it fate as well as an especially rainy spring that did the trick in 1889? At the top of the canyon, members of the South Fork Fishing and Hunting Club, men like iron and steel magnates Andrew Carnegie, Henry Clay Frick and Andrew Mellon, as well as the crème de la crème of Pittsburgh high society (the city was only 60 miles away) had long enjoyed the pleasures of that man-made lake. They had gone fishing, paddle boating and sailing there for years. And for years, engineers kept informing the iron and steel barons that the earthen dam holding back its waters was defective. The spillway was both too small and clogged with fencing materials meant to keep the expensive sports fish stocked in the lake from escaping into a nearby river. Auxiliary discharge pipes had decayed and leaks had been routinely noticed at the base of the dam even when the weather was especially dry. All was not lost, however. Some years after Johnstown was rebuilt, Andrew Carnegie donated one of his libraries for which he would become so widely celebrated. Bubonic plague returned to San Francisco when the earthquake of 1906 sent hordes of rats racing through the rubble, chasing through the raw sewage spilling into the streets as the city’s sewer pipes crumpled. Anyone was potentially susceptible. In one way the earthquake had been an equal-opportunity destroyer. Chinatown, with its masses of poor living in squalid wooden shacks, was razed to the ground by the quake and subsequent fire. Other working class precincts were similarly leveled and burnt. But so, too, was Nob Hill, where the city’s gilded elite lived. A mythic memory of communal suffering, self-sacrifice and mutual aid emerged in the immediate aftermath of the San Francisco disaster, as it still does in the wake of many similar collective traumas. After 9/11, as after Superstorm Sandy, stories of how people from all walks of life banded together to help one another were commonplace. This was even true in Chicago after the fire, notwithstanding the white-hot hostilities between the classes and the masses. These are not fables, but moving accounts drawn from real life. They offer a kind of hope in disaster and, consoling as they are meant to be, linger on, sometimes forever. Meanwhile, interred and resting in peace are often the disaster’s darker doings. Looking back on earthquake-ravaged San Francisco, a well-off refugee remembered that the calamity “did not discriminate between tavern and tabernacle, bank and brothel.” Yet the wife of the president of Levi-Strauss and Co. drove up to one of the relief centers in her limousine (in those early days cars were still mainly luxury machines and she owned one of the handful of limos in the city). She was, of course, ushered right to the head of its endless line. Even in these immediate post-quake reports, one could detect other motivations at work. So, for example, while San Francisco was ravaged, the death toll was calculated at only about 375 people. For a savage firestorm coursing through the most densely packed of neighborhoods, that low figure surprised people and left some wondering. The answer turned out to be this: the city fathers were determined to cite a low number so as not to discourage San Francisco’s rebuilding and the outside investments that would require. For many years, the figure was nonetheless accepted as accurate. Recently, however, through the diligent efforts of researchers, we know that the numbers of dead were probably 10 times higher. News of the bubonic plague was suppressed for similar reasons. Calculations of that kind informed many aspects of the tragedy. While sitting atop the San Andreas Fault is not ideal, should the underlying tectonic plates move a bit, not much was said about other contributory causes. Minor earthquakes had erupted for decades and these had been set off, at least in part, due to the hydraulic mining that accompanied the California gold rush in its later years. The operation to relieve the distress of hundreds of thousands of homeless people after the quake was tainted by class and ethnic biases not unlike those in Chicago. Relief camps segregated refugees by class as well as race and gender. Firefighters pooled water and equipment to save the homes of the wealthy first. In working class districts, fire-fighting focused on commercial properties like a Folger’s Coffee warehouse and freight sheds, not on saving homes. Seventeen hundred troops under General Frederick Funston guarded richer precincts because, as he explained, “San Francisco had its class of people no doubt who would take advantage of any opportunity to plunder the banks and rich jewelry…” Chinatown did not die an entirely natural death either. It was dynamited to create firebreaks and so prevent the fires already raging there from spreading to tonier neighborhoods. Two years after the event, poor people were still living in “relief cottages,” tents and other makeshift accommodations which, at rental rates of six dollars a month, many couldn’t afford. To get relief required a letter from a clergyman testifying to one’s moral worthiness. Working class women took to the streets to protest. Help was, however, on the way. Special rehabilitation funds were reserved for single women so they could resume their lives of domestic service. If rehabilitation and recovery was on the civic mind, certain minds counted more than others. Everybody knew that the city’s wood-frame buildings could not stand up to the pressures of another earthquake, which—they also knew—was a reasonable future possibility. So new building codes were adopted calling for the use of reinforced concrete and steel in structures over six stories high. They lasted a year. Pressures from the business community and builders caused the city to relax those rules, except in the new downtown which was urgently readying itself for the Panama Pacific International Exposition of 1915, where the city’s boosters hoped to eradicate the last pungent odors of the calamity. A $500 “bonus plan” to help rebuild homes favored the native-born and two-parent households. Housing rehabilitation began with the wealthy and worked its way very slowly to the poor. There were lots of jobs for “earthquake mechanics,” but at wages that could never keep up with escalating rents driven by real-estate speculators. Neither was Chinatown. San Francisco’s upper crust, as well as large portions of its white middle and working classes, had never been fond of the Chinese in their midst, even though they depended on their labors. The quake struck the city’s burghers as an opportunity to funnel them out of the center of the city—the old Chinatown had largely been destroyed—to some enclave on its outskirts. (“Fire has reclaimed civilization and cleanliness from the Chinese ghetto.”) Their plans were, however, successfully thwarted by the concerted resistance of the Chinese community. Resistance notwithstanding, Chicago and San Francisco emerged from their trials by fire as bustling centers of capitalist enterprise. Disaster capitalism has a long history. One of the last remaining “relief cottages” built by Funston’s army at the cost of $100 and rented for $2 was just recently sold for $600,000. Recently, when the Republican majority in Congress temporarily blocked funds for Sandy relief and rehabilitation efforts, it was a chilling reminder that no matter how universal a calamity is, we live in times when the commonwealth regularly takes a backseat to wealth. Appeals to fellowship, to mutual assistance and shared sacrifice seem to give way with scandalous speed to the commanding imperatives of a warped economy and political plutocracy. More Sandys are surely headed our way, more climate-driven disasters of all sorts than we can now fully imagine. And rest assured, they will be no more “natural” than the Chicago fire, the Johnstown flood or the San Francisco earthquake. More than fire itself what we need to deal with now is the power of the finance, insurance and real estate—or FIRE—sector whose leading corporations now effectively run our economy. Without doing that, the “nature” these interests have helped create will punish us all while providing a ghoulish boondoggle for a few. The battle over Keystone XL rolls on. Read Peter Rothberg on how to plug in.